In summer 2018, the Concordia University Ann Arbor School of Nursing launched three global clinical sites for students to complete their community health clinical hours. Twenty-six nursing students spent time in Guatemala, Uganda, and Kenya volunteering their time and talents in rural slums, clinics, community hospitals, and family households. The summer trips contributed to a record-breaking study abroad year for Concordia University. In 2017-18, the university sent 315 students—representing online, centers, and the Mequon and Ann Arbor campuses—on dozens of distinct global learning opportunities in more than 30 different countries. It’s all part of a growing effort to expand Concordia’s international footprint throughout the world and form mutually beneficial international partnerships to allow for the two-way exchange of professors and students. On the CUAA campus, the number of students taking advantage of global learning opportunities has dramatically increased thanks to the three new Global Education courses that were offered over the summer. Global Ed courses are faculty-led study abroad opportunities that can be completed for course credit and typically last one to three weeks. While the addition of three new student trips in just one year was already an uncommon accomplishment for CUAA’s School of Nursing, the program has sights set on increasing global opportunities for students in 2019. Upon their return, nursing students have been eager to share how they are forever-changed because of their global summer experiences. Concordia nursing partnered with MOST ministries on their trip to Guatemala. 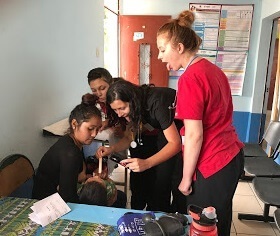 Led by Professor Dr. Mihaela Zegrean, one junior and six seniors spent their time focusing on water sanitation and nursing care provided in a public health clinic interacting with the people of Lake Amatitlán area. The students provided nursing care to patients with respiratory infections, GI problems, skin diseases like scabies, and even gangrene. The nursing students also ran a mobile clinic in a distant village to administer vaccines to children and assist with medical consultations to individuals unable to make it to the clinic. #CUAA student Alexandria Carr (’18) encourages a patient to stick out his tongue. A day that Reyes will never forget is when the group took a trip to a woman’s home who was receiving the gift of a new vented stove for her home, donated by a volunteers from a Lutheran church in California. Reyes said she and her Concordia classmates were speechless after what they had witnessed, but felt blessed by the opportunity to use their God-given talents to sincerely impact the lives of the people they were meeting. Reyes says that even though they sometimes felt like small gestures, she knows that some patients would not have received care had she and others from CUAA not been there. Reyes hopes other nursing students from Concordia get the opportunity to go to Guatemala and use their nursing skills to help those living in the village of Lake Amatitlán. CUAA partnered with Hope without Borders for the global clinical in Kenya which focuses on nursing care provided at clinics, hospital settings, and home visits as well as water and sanitation. 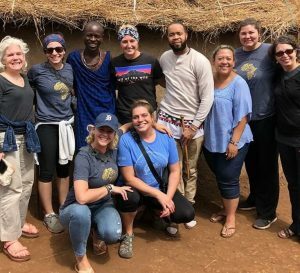 Along with school of nursing professor Peggy McLaughlin, seven CUAA students (6 juniors, 1 senior) travelled to very rural areas of Kenya to do healthcare visits in areas where such care is extremely limited. The students also assisted with health clinics and providing hygiene kits of soap, deodorant, and underwear for students in the Mukuru slums. Turome Chandler (’18) holds Wynnsor Ann in his arms after her delivery. 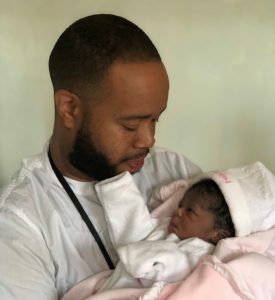 One student, Turome Chandler (’18) even had the opportunity to help deliver a baby girl. Chandler was granted the high honor of helping to name her. Chandler originally chose to travel to Kenya because he had heard great things about the kindness of the people and the tastiness of the coffee. What he didn’t know is how much he would learn about himself and his future vocation as a nurse because of his experience. Chandler says there is so much more learning that takes place when you are faced with the realities of a total immersion experience. The students washed their clothes by hand, heard lions roar as they slept in hut-like structures, and experienced the reality of poverty first-hand from the Kenyans that they helped and befriended. 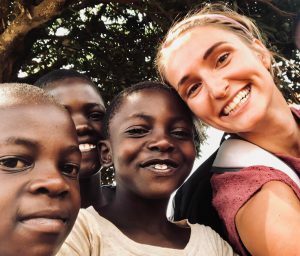 Ashlyn LeBlanc (’19) shared that she will never forget the day the group traveled to the Mukuru slums to pass out hygiene kits to the children. Their homes, measuring 10 feet by 10 feet, were made from metal shipping containers. They would run their businesses selling fruits, vegetables, and homemade goods out of the front of their homes and use the back of the homes as their living quarters. On the final day of the Kenya trip, the group visited a Masai tribe. The CUAA student nursing students are standing in from of one of the homes called “mud huts,” consisting of two bedrooms and a kitchen area. 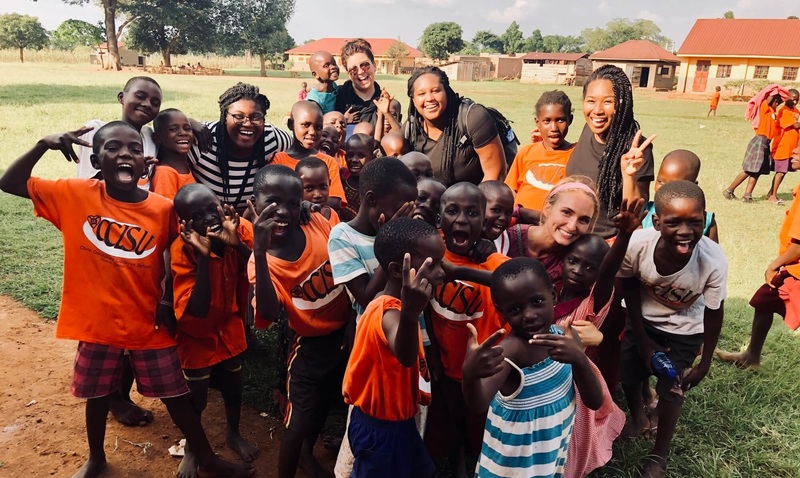 LeBlanc, Chandler, and their classmates worked with patients at the St. Joseph Shelter of Hope Hospital in Voi, Kenya and Beacon of Hope in Nairobi, Kenya. Along with assisting with two c-sections, the nursing students provided fluoride treatments to 110 children, fit people for eyeglasses, and helped many who are affected by HIV. Twelve CUAA nursing students (4 juniors, 8 seniors) partnered with Women of the Pearl to serve and study in Jinja, Uganda. This trip was led by school of nursing advisor Angie Raasch. Senior Caitlyn Freshour (’18) chose this trip because of its emphasis on women’s health. Freshour, a volunteer at the inner-city Detroit pre and post-natal The Luke Project 52 Clinic, learned that sometimes the problems you face as a nurse are not in your own control to fix. Freshour was grateful that this trip offered opportunity to continue to develop cultural sensitivity and finding ways to connect with people despite the many differences and foreign environment. Caitlyn Freshour (’18) smiles with her new friends from Christ Community Lutheran School. Concordia senior Shalena Blocker (’18) remembers the groups’ time at Nakivale refugee settlement as a day that she will never forget. Because the children didn’t speak English, Blocker began making animal noises to make the children laugh. Blocker, who like Freshour, chose this trip because of its emphasis on women and children’s health, shared the sense of helplessness she felt when she observed how much help was needed but was only able to assist in a limited capacity as a nursing student. 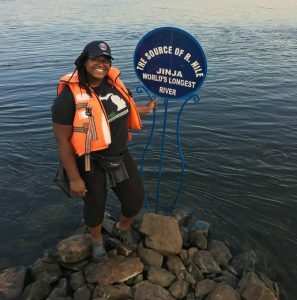 Shalena Blocker (’18) stands on the banks of the Nile River. Blocker stated that she knew that God led her to this trip for a reason, and that helped to ease her sense of helplessness. Blocker also experienced the Lord’s presence in a physical sense when the group took a trip to visit the Nile River. In semesters to come, the school of nursing is eager to increase global education opportunities for Concordia nursing students. Plans to return to Guatemala, Kenya, and Uganda are already in place in addition to new trips slated in Romania, Belize, and Tanzania. To learn more about CUAA’s school of nursing visit www.cuaa.edu/nursing.